The Aztecs had a complex relationship with man’s best friend: dogs were companions, useful protectors of towns and agriculture, and food. It’s important to understand that the Aztecs did not sit down on a nightly basis and eat the family dog, and we don’t want to get lost in that particular aspect of the Aztec-canine relationship. Dogs and humans share a very long history, with initial domestication starting 15,000 years ago, eons before the beginning of the Aztec empire. Humans carefully selected traits that benefitted them, and dogs became loyal companions, learning to hunt and protect agriculture. 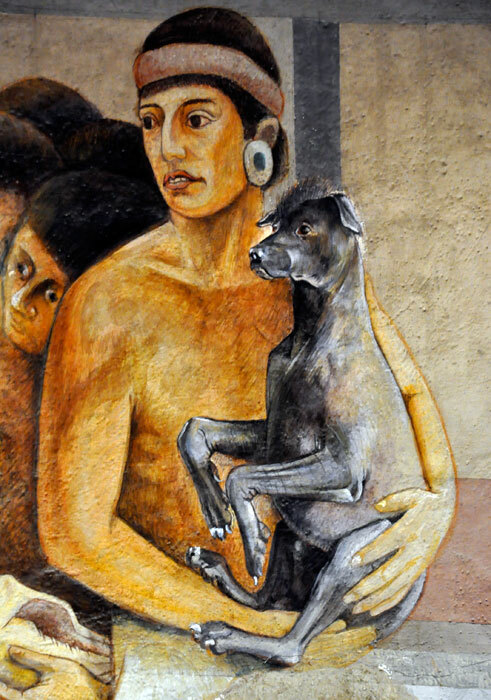 During the fourtheenth through sixteenth centuries, dogs became an integral part of the Aztec urban culture, though some remain wild and untamed. Early Spanish visitors to the American continent noted four different kinds of dogs living among the Aztecs, and three of these were domesticated. The fourth type of dog, labeled the itzcuintepoztli in Nahuatl, the language of the Aztecs, was a wild dog that some Spanish chroniclers called “the Eater.” Its name literally translates to “hunchback in the guise of a dog.” The itzcuintepoztli was common in the Aztec region, and it was very cunning and dangerous. Reportedly, the wild dogs lived around the edges of the towns and attracted domesticated dogs with their howl. Then they trapped, killed, and ate them. 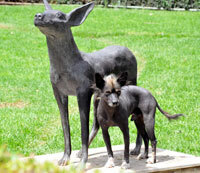 The village dogs were companions to the Aztecs, and some were identified as the xoloitzcuintle (xolo), or the Mexican hairless dog. These dogs were rare and valued throughout the empire, and remains of the dog have been found in archaeological digs that date all the way back to Tula (ca 1000 CE), and there are images of this specific dog in Teotihuacan (100-800 CE.) The dogs weren’t just companions, then, but they also served to link the Aztecs to older powers in Central Mexico. Because the Aztecs were relative newcomers to the region, these links were very important, and the dogs were a very visible way of creating them. Xolos are still around today, and their appearance hasn’t changed that much since Aztec times. * Their hairlessness is caused by a genetic mutation, and puppies born in any litter can have a variety of amounts of hair. (You even see some with just a tuft of hair on their head! I always thought this was groomed, but it can sometimes be natural.) Xolos ranged greatly in size, weighing anywhere from ten to fifty pounds, with sleek and muscular bodies. The dogs came in many colors, most commonly in black, blue, and red. They had long, slim necks and almond-shaped eyes, with large ears. 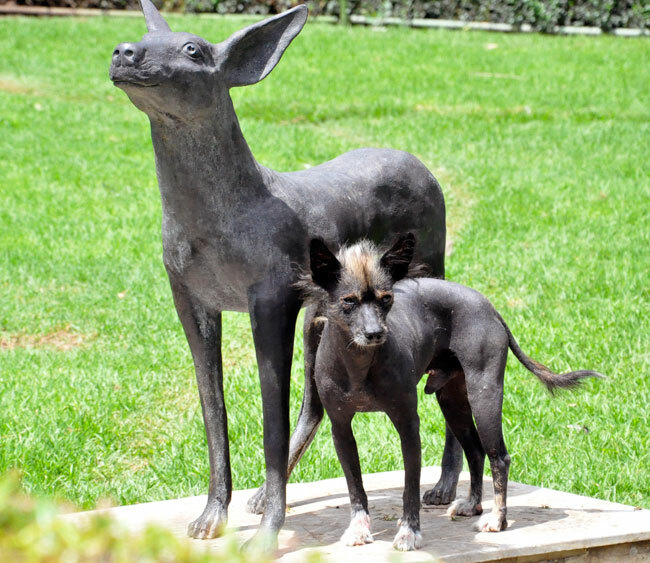 It is likely that xolos served as companions to the Aztecs in this life and also in the after-life, as many dog remains and dog sculptures have been found in Aztec burials, including some at the main temple in Tenochtitlan. Dogs were often victims of ritual sacrifice, so that they could accompany their master on his voyage through Mictlan, or the underworld. Their main duty was to help their owners cross a deep river, and it is possible that dog sculptures also found in burials were also intended to help people on this journey. 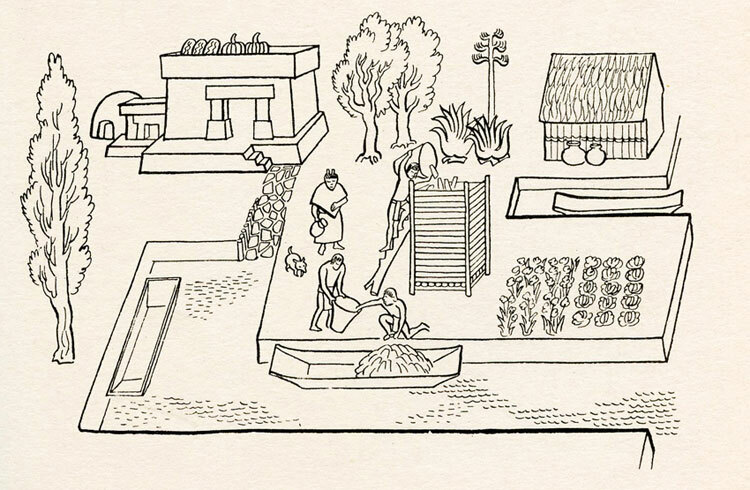 Additionally, there is both archaeological and ethnographic evidence of a dog market in the town of Acolman, and scholars believe that the career of dog breeder must have been very lucrative. In her book America’s First Cuisines, Sophie Coe argues that breeders took great care in feeding their dogs, most likely feeding them a diet of maize. ** Plenty of evidence exists to show that the Aztecs did use dogs as food, but it is unlikely that these were the same dogs they kept as companions. Dogs were an integral part of the Aztec world, but they weren’t quite pets and they weren’t quite dinner either. Just as we make a distinction between animals we keep domesticated in our homes and the animals we eat, the Aztecs did too. There is little evidence that they regularly consumed their household dogs, but they did sacrifice them, so that the dogs could continue to serve as companions in the afterlife. This shows that they valued dog’s loyalty, faithfulness, and intelligence as much as we do. 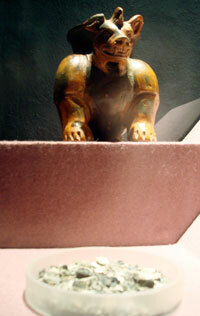 *Since the sixteenth-century, humans have mainly tinkered with behavioral traits of the xolo. 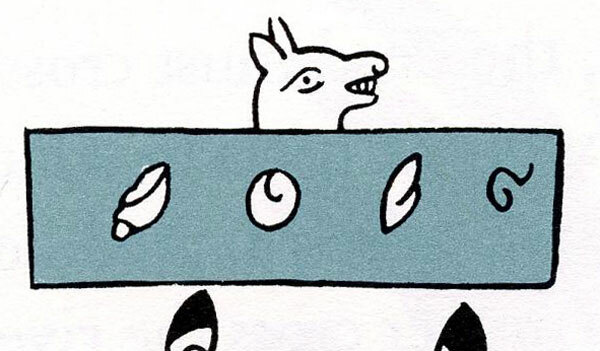 **Coe is basing this in the portrayals of the famous Colima dogs, which often have corn cobs in their mouths. This article is so insightful and helpful. 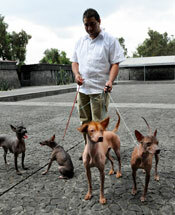 I’m working on a paper about Dogs in Mexico and this article is the best that I’ve found! Mexicolore replies: We’re delighted to hear this, Mary - thanks for your kind message!